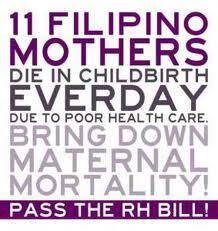 While these are mainly women issues that need an urgent resolution by the current Philippine government, most people are wondering why the Catholic Bishops are indulging on RH bill issues not of their concern. There are a lot of things that the Philippine bishops themselves can be preoccupied about other than the RH bill, and that is to restore the dwindling image of the Catholic church as the bastion of morality by policing their own ranks of scalawags. The bishops are supposed to be the role models. As a servant and follower of Christ as they always say, they should have deprived the comfort of this worldly life to replicate what Christ did while he was still in this world, as depicted in the bible. Sad to say, that the bishops themselves are struggling and too insensitive in protecting their guarded reputation of morality and that’s the reason why there is a PCSO scandal and immorality issues thrown against them. The bishops don’t care if the funds they are soliciting comes from private gambling dens or a government lottery institution like the PCSO, or from any illegal means of questionable sources as long it serves their purpose and caprice, they simply don’t give a damn. Even their judgement and decision according to them were flawed when the bishops admitted why they prefer the expensive sport utility vehicle (SUV) over the much cheaper public utility vehicle (PUV) for their archdiocese in serving the poor, though they would not admit it but the intention is clear that the SUV is for their personal use. They have declared that the vehicles in their custody were used in their archdioceses to serve the poor in far flung areas. The question is how they really serve or help the poor? Are they giving dole outs? Are they offering mass, conduct baptism, confirmation, funeral and marriage services for free or for a fee? These are the basic questions that the public wants to know, because the Catholic church has been noted in giving services for a fee and not for free. They have succeeded in bringing to the people’s consciousness as the people become subservient to the church wishes as if the people have an obligation to collectively and financially support the church in the name of charity. They have not told to anyone that the revenue generated out from the fees and other sources of church income in the Philippines is being remitted to Vatican. As the overseas Filipino workers (OFW) is remitting his hard earned dollars to his home country to make the Philippine economy afloat. the Catholic church since time immemorial is draining out the country’s dollar reserves by way of remitting to Vatican the revenues generated from their operations in the Philippines. They have not only done it to the Philippines but to other countries as well which had been once upon a time a colony of Spain and are predominantly Catholic. As a religious establishment they are the most privilege institution in the Philippines, they own the most profitable schools in the Philippines that charges exorbitant tuition fees, own vast tracts of lands on different locations all over the country without paying realty taxes, the revenues derived from their operations are tax free as well. The bishops’ anti RH bill stance is only a ploy by the church that they have a moral crusade to call for in the guise of “saving the unborn from the modern Herods” but in reality the RH bill go against the Catholic church vested business interests in the Philippines. 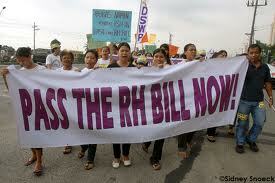 What they are concern is that with the passage of the RH bill there will be a dramatic reduction in the number of born babies and eventually reduce in the long run the population of the faithfuls for the next and succeeding generations to come and this will automatically reduce the church derived income from baptism, confirmation, catholic schools enrollment, church attendance, funeral and marriage services. They either don’t care about population explosion because it serves favorably to them or poverty because they neither housed the poor families nor feed the poor children, after all it is not the church’s responsibility. Besides there is a government that can be a brunt for scapegoat by the Filipino people when everything goes at its worst. Have you heard that the Catholic church or the Vatican after all those remittances, have extended financial help in return to the victims of natural calamities in the Philippines? Nope, nada, zip, zero or nothing. If they complain or go against of something like the RH bill, mind you they have vested interest that is at stake they wanted to protect. The pedophilia issue which has been known since the friar days in the Philippines is now a worldwide phenomena. The Catholic church should have resolved this issue long time ago and be transparent on issues involving their men on immoral acts and the church leadership should be decisive enough to chastise them. Not until this is happening the pedophilia issue will go unabated because the crime offenders themselves have gone scot free and left unpunished.